Dubai Tower opens next month. But will this crowning jewel also be the city’s high watermark? Burj Dubai, or Dubai Tower, will be the world's tallest building. 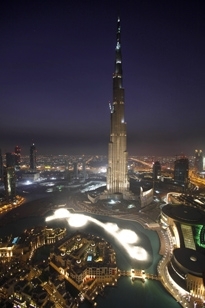 Burj Dubai, the world’s tallest tower, is a spire of superlatives. The 160-story skyscraper will open on January 4, the fourth anniversary of Sheikh Mohammed bin Rashed al-Maktoum’s rule in Dubai. Under the Sheikh, Dubai has seen a boom in record breakers, impressive firsts, and baffling spectacles. For example, the city is or will be home to the world’s first refrigerated beach, a twirling tower, the world’s largest arch-supported bridge, and artificial islands in the shape of the world map. • At 2,700 feet tall, the skyscraper can be seen from 10 miles away. • The building will sport the fastest elevators in the world, traveling at 10 meters per second (22 miles per hour). They will also be double-decker elevators, with each deck supporting up to 21 people. • To keep out the desert heat, 10,000 tons of coolant with flow through the tower every hour. • 230,000 cubic meters of concrete form the building’s core, enough to pave 1,180 miles of sidewalk. • Dubai Tower will be the highlight of the worlds’ largest indoor shopping center, with space for 1,200 shops nestled among 30,000 apartments. Plunging property prices and weak demand had already put a dampener on new schemes even before last week’s shock announcement by state-owned giant Dubai World that it wants to halt debt payments for six months. “It’s not exactly going to improve investor confidence,” said Matthew Green, associate director at property agency CB Richard Ellis, which has reported a 55 percent year-on-year drop in downtown Dubai commercial rental rates and a 67 percent fall outside the centre.